As a part of Home Glow’s “California Casual Glam” project, my client wanted a little help making her guest room into a Big Boy Room for her toddler. The footprint of the room is fairly small, with a good amount of real estate being commandeered by a double bed. I wanted to have her son’s desk to double as a nightstand. I wish the below would have worked out…. … but it didn’t (as you’ll see why later down — nothing wrong with the piece! ), so it’s still available! Now, nothing says “BOY” like campaign furniture — the squared ends, the brass hardware, the whole English-regency-style military thing…. I don’t know a single soul who doesn’t love it. If you’re lucky, you can score some good vintage pieces, but even the beat-up ones aren’t cheap these days. Hence, every big box store in the world has some campaign furniture, like here (cheapest and tons of colors), here, here, here, and here. Unfortunately, my client and I were looking for something very specific. Due to the lack of storage space in the room, we wanted deep drawers like in the vintage desk in the top picture. BUT due to the room’s layout (We wanted the lamp — her husband’s boyhood favorite — to serve double-duty as a bedside reading lamp. We also didn’t want the desk chair squashed against the bed. 🙂 ), we needed those drawers to be stacked on the right side of the desk — NOT the left. Now, I have no idea why, but there are VERY, VERY few desks that were made this way. 19 out of 20 vintage campaign desks have the drawers on the left. Luckily, my client lives in the San Francisco Bay area, a thrifter’s paradise of mid-century goodies. After a long enough search on Craigslist, she found a beat up vintage desk, exactly the size and format we needed and scooped it up. We had it refinished it in a rubbed black. Here’s the update pic she sent me. The color is Midnight Dream by Benjamin Moore in an eggshell finish. Yes, we definitely luckered out. However, if we hadn’t, my next stop would have been one of these fabulous Etsy sources for campaign furniture. Some specialize in remaking vintage beauties, and some create solid hardwood masterpieces made to order. Choose your poison! My first 2 Etsy sources are from the great state of … NEW HAMPSHIRE! Yay! Exeter Fields first came to my attention when they were featured in the Boston Globe. They make gorgeous, custom campaign furniture with a brilliant lacquer finish. Don’t drool too much, now! As seen on HGTV Magazine! Another custom campaign furniture source, from right here in New Hampshire! I love some of the wood finishes and drawer layouts Woodland is doing. Maybe it’s the New Englander in me, but I love the tiger maple wood! Media stand. The doors open up for media storage. I love me some pretty stained wood. Comes with changing table, moms! I’ve been following MegMade Inc. for years and years. She started out painting vintage furniture, and now she has more than 33K followers on Instagram and a pretty big friggin’ store in Chicago. She does custom work now, as well. Her Etsy store is full of unfinished pieces — so look at some of the below inventory and imagine it in the hue of your dreams. The price you see is for the finished piece, according to the color you choose. Freight is extra. There are A LOT more pieces than I show here, so check out Meg’s store. Side note– if you’re worried about painting these vintage beauties, don’t be. While well-made, these are not fine antiques that will diminish in value or aesthetics because of a coat of paint. As with most of MegMade’s furniture and my next source’s, Sucheta of the Resplendent Crow refinishes vintage furniture in her own glam way. 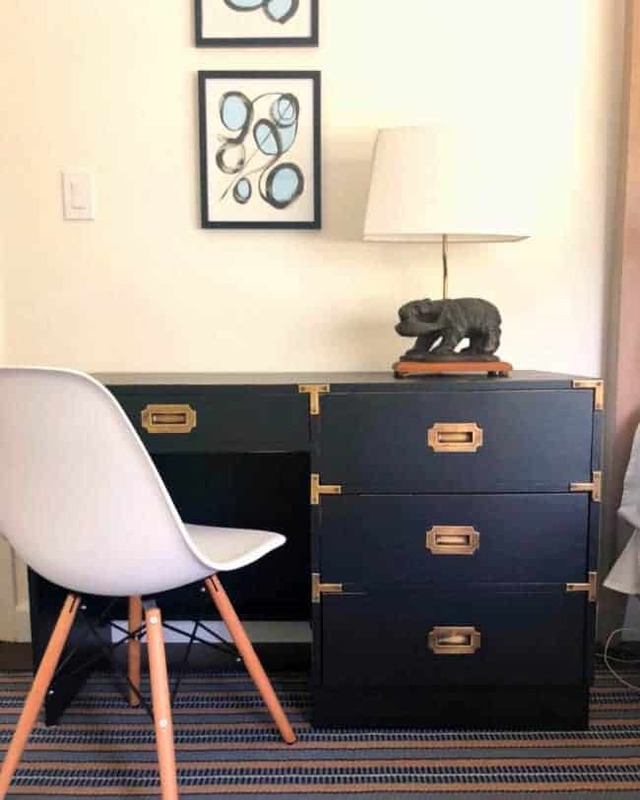 Based in Missouri, she has a wonderful inventory of pairs of nightstands — a definite plus for all those king and queen beds out there! She also has a number of faux-bamboo, English/Hollywood regency campaign-style pieces. So much more than I have here. Shipping included in price! Chicago must have been booming in the ’60s and ’70s, because here is another Chicago-based upcycler with a huge inventory of campaign furniture. There are some amazing prices here. Oops! I have one more source for you! MVV (formerly “My Vida Vintage”) is a fully custom source based in Los Angeles. The MVV’s Etsy store also includes some closeout and Quick Ship items. 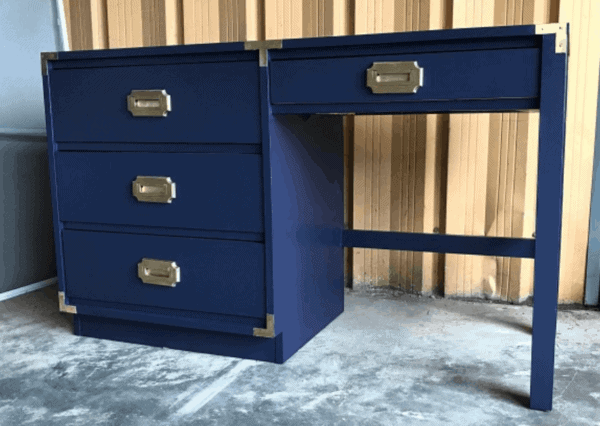 Wall-mounted, vanity, metal-wrapped campaign furniture … you name it. Much like everything else — if you want it, you can get it in L.A.
And here’s a conglomerative Pin by which to remember this post! Do you have any uses for any of the above campaign pieces? 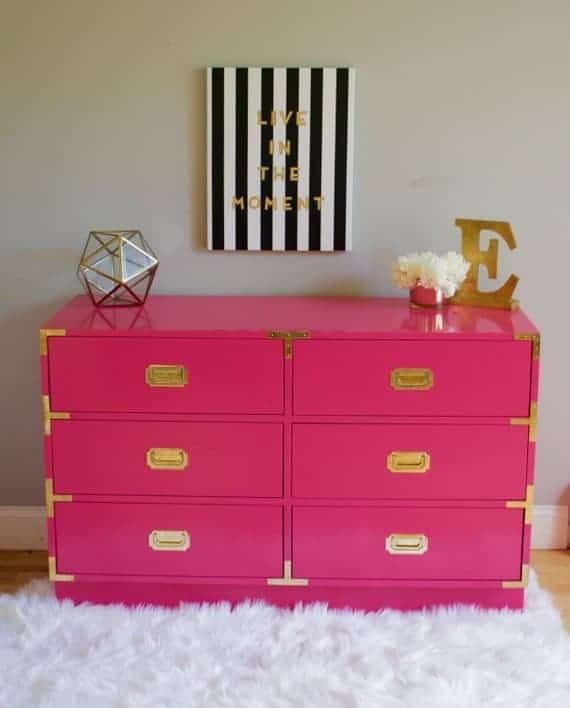 I’m dying to put a purple campaign dresser in some tomboy little girl’s room! ‘Til next Saturday — stay dry and warm!